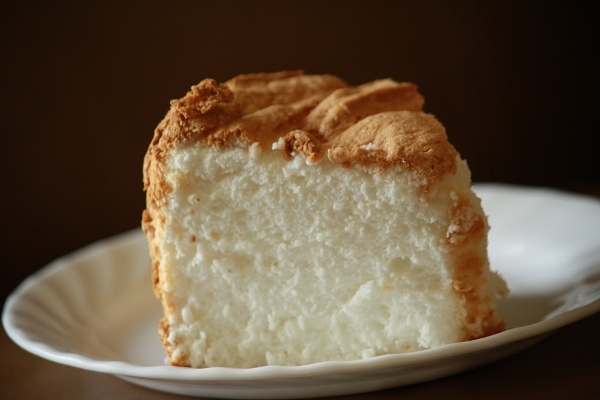 My mother-in-law made this gluten free angel food cake from a Taste of Home recipe, and everyone loved it. The taste and texture was perfect and there wasn’t a bad aftertaste. I could barely save off a piece for the picture– this recipe is amazing!! Place egg whites in a large bowl and set them on the counter for 30 minutes. Sift 3/4 cup sugar, cornstarch, flours and potato starch together twice in another bowl. Add cream of tartar, salt and vanilla to egg whites; beat on medium speed until soft peaks form. Gradually add 1/2 cup of sugar, about 2 tablespoons at a time, beating on high until stiff peaks form. Fold in flour mixture 1/2 cup at a time. Gently spoon into an ungreased 10-in. tube pan. Use a knife to cut through the batter and remove the air pockets. Bake on the lowest oven rack at 350° for 45-50 minutes or until lightly browned and entire top appears dry. Turn the pan upside down and let it completely cool (about 1 hour). Run a knife around side and center tube of pan. Set the cake on a serving plate. Mash strawberries, whip up some heavy whipping cream and ENJOY!! One Response to "Gluten Free Angel Food Cake"
THE BEST Angel food cake in the world!!! Forget the wheat completely. I am not gluten intolerant, but I will never make any other Angel food cake again. Thank you!